ReCivitas have experimented a basic income pilot project in Quantinga Velho, Brazil since 2008. 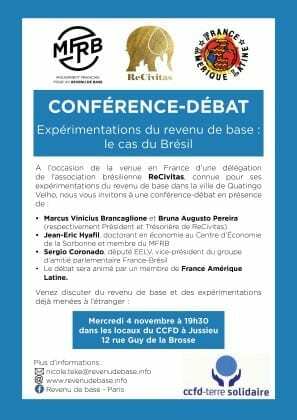 The delegation of ReCivitas is on tour in Europe, and will join a discussion in Paris. The Venue:Terre Solidaire (12 rue Guy de la Brosse, metro Jussieu). The detail can be found here (in French).